Safe Landing believes rehabilitation should nurture the mind, body, and spirit. Our comprehensive treatment programs are coupled with the best amenities to make recovery seamless, fun, and enlightening for teens. 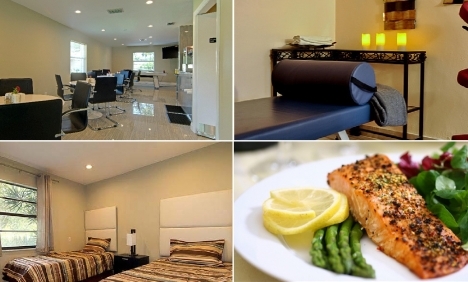 Our treatment facility is headed by the best professionals in the industry who are dedicated to the recovery process. Rehabilitation should be enjoyable, that’s why we pride ourselves on giving our clients a stimulating environment of healing every step of the way. Recently refinished, Safe Landing’s housing accommodations are designed to promote a tranquil, recovery focused atmosphere. With 24 hour clinical supervision, we ensure your teen is comfortable and secure for an optimal recovery experience. Our fully outfitted recreational room features pool and ping pong tables , board games, and other fun activities. Clients are guided through physical fitness activities several times per week to help maintain and improve health throughout the recovery journey. These activities vary, but are always fun and geared toward inspiring a healthier lifestyle. Our clients receive three catered meals each day and unlimited snacking options. Does your teen have special dietary restrictions or preferences? Let us know! We’re happy to make any accommodations necessary to ensure your health and dining habits. Cultural stimulation and exposure is a necessary part of rehabilitation and re-acclimating into life beyond substance abuse! Safe Landing offers outings to movies, museums, bowling, sporting events, and other fun recreational activities in the area to enrich your teen's recovery and quality of life. Safe Landing provides regular on-site haircuts to all clients. Safe Landing provides excellence in employment skills, educational planning, and resume building throughout treatment. Clients work one-on-one with case managers to ensure all educational and occupational needs are met, ensuring a smooth transition from treatment into daily life without illicit substances.